Takano, H, R Yanagisawa, K-I Inoue, T Ichinose, K Sadakano, and T Yoshikawa. 2006. Di-(2-ehylhexyl) Phthalate Enhances Atopic Dermatitis-Like Skin Lesions in Mice. Environmental Health Perspectives 114: 1266-1269. The prevalence of allergic reactions has been increasing rapidly in the developed world for the last several decades. This has been happening during a period when overall air quality has been improving and during which there is no reason to believe that allergens like dust mites or cockroach dandruff have become more common. These observations have led some scientists to propose that unidentified environmental exposures may be increasing the sensitivity of people's immune system, leading to heightened allergic responses even though the level of allergens hasn't increased. In this paper, Takano et al. provide a clue as to a possible cause of this increase, reporting that exposure to low, environmentally-relevant levels of the phthalate DEHP exacerbates allergic reactions in mice to a dust mite allergen. They conclude that exposure to DEHP may be contributing to the increased incidence of allergic reactions in developing countries, where phthalate exposure is now ubiquitous. Lower doses of DEHP had larger impacts than the highest dose used. This is the first report of a 'non-monotonic' or 'inverted-U,' dose-reponse curve for a phthalate. These curves, in which high doses do not predict low-dose impacts, have been reported for several endocrine-disrupting compounds and are regularly observed in endocrinological research. Not only did Takano et al. observe a non-monotonic dose-response curve in the allergic response to DEHP, the most effective dose at inducing the response they found was almost 1,000-fold beneath EPA's 'low effect' level, 19 mg/kg/day established by the EPA based upon studies of liver toxicity published in 1953. It is also close to the level of exposure identified by the US EPA as the maximum safe level (the so-called reference dose). Phthalates are widely used in plastics and personal care products, including cosmetics, toys, medical devices and lubricants. The diverse group of chemicals is associated with asthma in children, allergen related protein responses and several male reproductive tract problems, such as undescended testes, lower sperm counts, testicular tumors and shortened anogenital length. Takano et al. wanted to determine if the common plasticizer di-(2-ethylhexyl) phthalate (DEHP) increased severity of allergic reactions in mice exposed to a common dust mite allergen, Dermatophagoides pteronyssinus (referred to as DP). DP can provoke mite allergies with allergic mice developing itchy rashes and other skin conditions caused by the response of their immune systems. In the study, 7-week-old mice were separated into three control groups and 4 experimental groups, with 16 animals per group. Three control groups: (1) no treatment, (2) treated with saline solution and olive oil, and (3) animals treated with saline solution, olive oil and exposed to the dust mite allergen. Olive oil was included in 2 controls because it was used as a 'vehicle' in which DEHP was dissolved, for delivering DEHP to the experimental animals. The mite allergen was injected in the lower side of the mouse's right ear 8 times over 16 days. The day of the first DP injected was deemed Day 0; subsequent exposures were delivered on days 2, 4, 7, 9, 11, 14, and 16. Animals dosed with DEHP were injected 4 times by intraperitoneal injection; these treatments occurred on days –4, 3, 10, and 17. A day after each DEHP treatment, researchers measured ear thickness and evaluated skin dryness, eruptions (sores, rashes), edema (water retention) and wounds. Each category was scored 0 to 3 (0, no symptoms; 1, mild; 2, moderate; and 3, severe), and the results added to obtain a clinical score. Immune cell responses in the ears were measured two days after the final DEHP injection. Takano et al. counted the number of eosinophils, special white blood cells linked to allergies. The tissue was also analyzed for eotaxin, one of eosinophils' chemical products, and macrophage inflammatory protein-1alpha (MIP-1alpha). Both cell products are involved in immune and inflammation responses. The researchers also counted mast cells, evaluated their spread and determined their loss of granules. Mast cells release histamine that causes red skin and other symptoms associated with allergic reactions. The graph below shows changes in the clinical score for severity of allergic reaction during the course of the experiment. 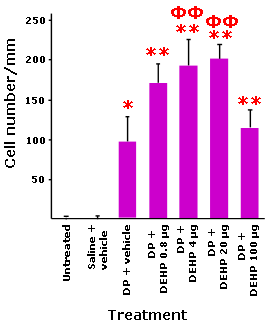 For three of the four DEHP treatments (0.8, 4 and 20 µg), DEHP exposure significantly increased the severity of the mice's response to the mite allergen compared to the effect on mice exposed only to the allergen (Dp+vehicle). In contrast, the clinical score for animals receiving 100 µg did not differ from the Dp+vehicle control. Adapted from Takano et al. The strongest allergic skin reactions, cell and tissue effects and immune protein increases occurred at the 20 µgram dose (red line in figure above). As would be expected, mice exposed to the allergen but not DEHP (Dp + vehicle) experienced more severe skin allergy symptoms starting 5 days after the first exposure than the untreated or saline/oil treated groups. In these animals, clinical scores for dryness, skin eruption, wounds, edema and ear thickening all significantly increased compared to groups not exposed to the allergen. These finding demonstrate that the allergen does indeed produce allergic reactions in exposed mice. Untreated group received no treatment. Saline + vehicle group received saline solution plus 'vehicle' (olive oil, used to dissolve DEHP). DP + vehicle received mite allergen plus olive oil. Others received DP + vehicle plus indicated dose of DEHP. ΦΦ p < 0.01 compared to Dp + vehicle. Takano et al. found similar patterns in the immune cell responses. For example, as DEHP exposure increased from 0.8, 4 and 20 µg, white blood cells (graph to left) and degranulation of immune mast cells increased with dose. These are indications of allergic reactions. Again, mice in the 20 µg treatment groups had the biggest changes compared to the allergen/oil mice. Mice that were exposed to 100 µg did not differ from mice that received the allergen but were not exposed to DEHP (DP+vehicle). 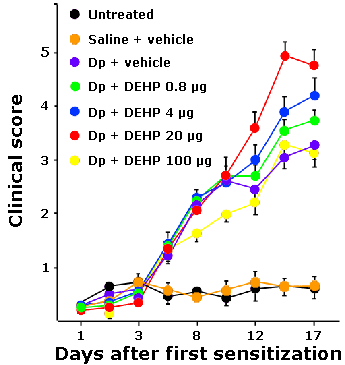 As with the clinical score (above) greater impacts were seen in mice exposed to allergen and 20 µg DEHP than mice at the higher 100 µg treatment. No cell changes were seen in the controls and saline/oil group. Allergen injections also increased protein expression of MIP-1 alpha and eotaxin, cell products related to immune responses. Allergen and DEHP treatments increased expression at 4 and 20 µg compared with no treatment and enhanced eotaxin at 4 µg compared to allergen/oil treatment. These results are consistent with the theory that increases in the frequency of allergic disease are being driven by contaminants that heighten immune system sensitivity, not by changes in the prevalence of the allergens themselves. For example, there is no evidence that cockroach dust has become more prevalent in inner city housing, yet asthma incidence has grown steadily in US urban centers over the past 20 years. Likewise, overall air quality has improved in most US cities over the same time span. In contrast, products containing phthalates have become much more common over the past decades. Takano et al. 's demonstrate that DEHP can boost allergic reactions at low, environmentally-relevant doses after exposure to a common allergen. According to Takano et al., the dose sufficient to induce an allergic reaction is similar to that currently deemed safe by the US EPA. In the authors' words, "DEHP caused deterioration of skin lesions and chemokine expression related to Dp (allergen) in atopic subjects (NC/Nga mice) at doses about 1,000-fold lower than the no observed adverse effect level that was determined on the basis of histologic changes in the liver of rodents (19 mg/kg/day" (a standard based upon data gathered in the 1950s). Prior studies have established links between allergic asthma and both phthalates and diesel exhaust. But Takano et al. 's results are important for another reason, as well: lower doses of DEHP caused larger effects than higher doses. Specifically, while DEHP doses from 0.8 to 20 µg increased immune reactions compared to controls, the higher dose of 100 µg had no such effect. This pattern of response, in which higher doses produce lesser effects, is called a non-monotonic dose-response curve (NMDRC). This is the first NMDRC for a phthalate. Similar 'inverted-U' shaped curves have been reported in animal and lab studies examining effects of endocrine-disrupting chemicals, including alkylphenols and bisphenol A. These dose-response curves are important because they invalidate standard methods to establish health standards. Why? The low-dose response seen at 8 to 20 µg can't be predicted from the results at higher levels. Toxicology normally assumes--wrongly-- that high dose experiments can predict low dose results, and if there is no effect at high doses, there will be no effect at low doses. The lack of difference between animals exposed to 100 µg and those exposed to olive oil + allergen (DP+vehicle) would be taken as evidence that no impact would be observed at lower levels either. In all likelihood those lower doses would never even be tested once it was determined that 100 µg had no effect. But in fact low doses stimulated the immune system to react more adversely than higher doses. How DEHP increases allergic responses may be related to their ability to increase expression of inflammatory cell proteins, called chemokines. Levels of two chemokines measured in this study were enhanced by DEHP at 4 and 20 µg. These signal proteins help spread inflammatory cells into tissues thus increasing allergic symptoms. People with allergy related atopic dermatitis have higher levels of the chemokines than those without allergies. This animal study establishes a relationship between DEHP and atopic dermatitis, an itchy skin condition associated with allergies. The results add evidence that low-dose exposures to certain types of phthalates enhance allergic reactions in the presence of an allergen suggesting "that ambient exposure to DEHP is a possible contributor to the recent increase in the incidence of atopic dermatitis."